Soil texture affects the soil environment and the mineralization of soil organic matter (SOM) in several ways. It has been reported that a rich clay content in the topsoil results in high levels of soil organic matter; at the same time, it enhances nitrogen, phosphorus and sulphur availability (Galantini et al., 2004; Duval et al., 2016). 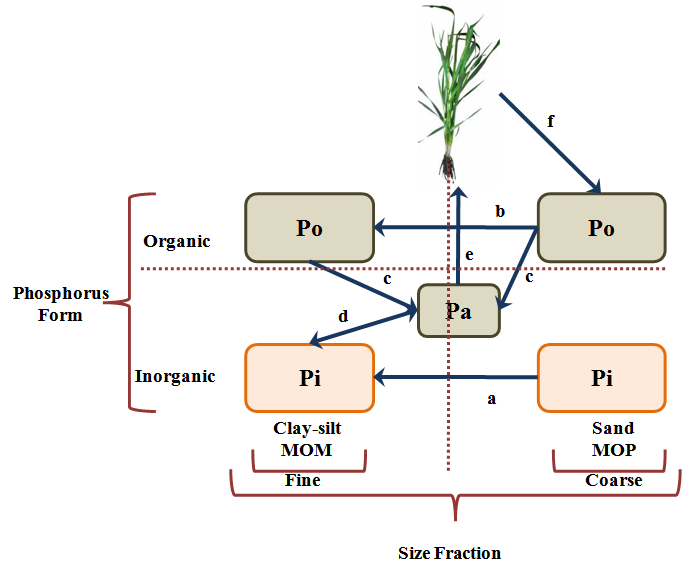 Soil P (phosphorus) equilibrium and availability can be modified by soil texture as a consequence of changes in physicochemical properties, in phosphate adsorption-desorption-diffusion processes, and in SOM mineralization-immobilization processes. Physical fractionation methods based on SOM particle size have been developed to separate organic fractions with different characteristics and dynamics (Andriulo et al., 1990; Galantini et al., 1997). It is therefore now possible to distinguish between SOM associated with the fine and with the coarse fractions, which have different structures and roles. The fine soil fraction (clay, silt) corresponds to a more humidified or mineral-associated organic matter (MOM), and the coarse fraction (different sizes of sand) to less transformed, labile, light or particulate organic matter (POM). Considering that both fractions are crucial to soil fertility, it is important to determine the organic (Po) and inorganic (Pi) phosphorus contents in each size fraction and to relate them to soil texture. Differences in P content are expected to be found in both particle size fractions: the fine fraction is likely to contain the more stable Po (Po-MOM) and the more available Pi (Pi-clay and silt sizes); the coarse fraction, instead, is assumed to contain the more labile Po (Po-POM) and Pi (Pi-sand size) with low availability in the short term. The hypothesis is that soil texture affects the equilibrium of the different P-forms in soils of the semiarid Pampas region, mainly through stabilization in the resistant organic forms of fine-textured soils and accumulation in the labile organic forms of sandy soils. The aim of the study is to determine the content and distribution of the main P-forms in texturally different soils and to relate them to the available P-index. Soil samples (0-0.15 m) were collected from 27 sites with different textures in a 25-year-old pasture located in the Experimental Station of Bordenave, Argentina (63°01’20”W; 37°51’55”S). Soil particle size fractions were obtained through wet sieving by separating the fine (0-100 µm) and coarse (100-2000 µm) fractions. Soil organic matter was determined in both fractions, and thus mineral-associated (MOM) and particulate organic matter (POM) were obtained, respectively. Extractable (Pe), organic (Po), inorganic (Pi) and total extractable (Pt) phosphorus were determined. Occluded P (Pocl) was calculated as the difference of [Pt - (Po+Pi)] applied to the whole soil and the particle fractions. In these soils, texture determines P content and the equilibrium of its different forms. Available P-forms (estimated by Pe) were related to the inorganic form present in the fine fraction of the soil. Phosphorus content in its different forms was closely associated with soil fractions. The level of Po was higher in the coarse fraction of the soils containing more fine fractions. All the studied P-forms were higher in fine-textured soils than in coarse ones. However, P-forms in particle size fractions showed different tendencies. In coarse-textured soils, Po in MOM was lower than in fine-textured ones, whereas P-content was higher in MOM and lower in POM compared with fine-textured soils (Rosell et al., 2000). Based on these results as well as previous ones, we propose a conceptual model to identify P changes in soils of different textures (Galantini et al.2005, 2007; Rosell et al., 2000; Suñer & Galantini, 2012; Suñer et al., 1998, 2002, 2013, 2014; Zalba & Galantini, 2007). 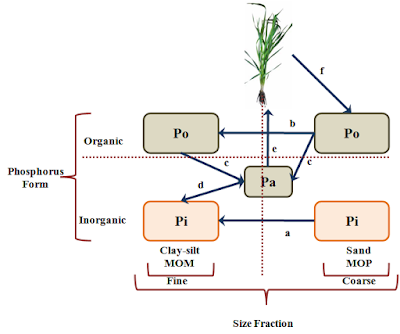 Soil organic fractions and their P-content within the sand fraction are inside the labile pool, whereas those within the silt and clay fractions are inside the intermediate and passive pools. Inorganic minerals of the coarse fraction can be considered a passive pool of P, while P in the fine fraction represents an active pool. According to this finding, a conceptual model can be proposed where P could be linked to SOM fractionation schemes. The principal flows in this model are a) weathering and physico-chemical processes, which reduce the size of coarse minerals until mineral particles reach a size below 50 µm and are then included in the fine fraction; b) humification, by which organic inputs are transformed into more complex molecules with a lower size; c) mineralization of SOM fractions, which produce nutrient release and make P available for plants; d) physico-chemical equilibrium, e) P-uptake by plants; f) recycled P, by which crop residue returned to the soil can improve Po by a POM increase. Andriulo A., J.A. Galantini, C. Pecorari, E. Torioni. 1990. Materia orgánica del suelo en la región pampeana. I. Un método de fraccionamiento por tamizado. Agrochimica (Italia) XXXIV (5-6) 475-489. Duval M.E., J.A. Galantini, J.M. Martinez, F.M. López, L. Wall. 2016. Sensitivity of different soil quality indicators to assess sustainable land management: Influence of site features and seasonality. Soil & Tillage Research 159: 9-22. Galantini J.A., L. Suñer, H. Krüger. 2005. Dinámica de las formas de P en un Haplustol de la región semiárida pampeana durante 13 años de trigo continuo. Revista Investigaciones Agropecuarias (RIA – INTA) 34 (2): 13-31. Galantini J.A., L. Suñer, J.O. Iglesias. 2007. Sistemas de labranza en el sudoeste bonaerense: efectos de largo plazo sobre las formas de fósforo en el suelo. Revista Investigaciones Agropecuarias (RIA – INTA) 36 (1): 63-81. Rosell R.A., J.A. Galantini, L.G. Suñer. 2000. Long-term crop rotation effects on organic carbon, nitrogen and phosphorus in Haplustoll soil fractions. Arid Soil Research and Rehabilitation 14 (4) 309-316. Suñer L., J.A. Galantini. 2013. Dinámica de las formas del P en suelos de la región sudoeste pampeana: Estudio de la incubación con fertilizante fosfatado. Ciencia del Suelo 31: 33-44. Suñer L.G., J.A. Galantini, R.A. Rosell, M.D. Chamadoira. 2002. Cambios en el contenido de las formas de fósforo en suelos de la región semiárida pampeana cultivados con trigo (Triticum aestivum). Rev. Fac. Agron., La Plata 104(2): 105-111. Suñer L.G., J.A. Galantini, R.A. Rosell. 1998. Comparación de métodos para la determinación de fósforo orgánico de suelos de la Región Semiárida Pampeana Argentina. Información Tecnológica (Chile) 9 (6) 51-54. Suñer L.G., J.A. Galantini. 2012. Fertilización fosforada en suelos cultivados con trigo de la región pampeana. Ciencia del Suelo 30(1) 57-66. Zalba P., J.A. Galantini. 2007. Improved soil tests methods for available phosphorus in acid, neutral and alkaline soils. Communications in Soil Science and Plant Analysis 38: 1579-1587.